Table tennis serving rules have changed over the years. Under the current ITTF rules, the player to serve first is chosen at random, with the winner of the random draw able to choose to serve first or receive first. Sometimes in casual games, the first serve is chosen by volley, where a "practice" rally is played to determine who serves first. The player who is serving changes after a certain number of points are scored. Under the current ITTF rules, in an 11 point game, the service changes every 2 points. In the past, when games were played up to 21 points, the service changed every 5 points. Here is an example of how this works. 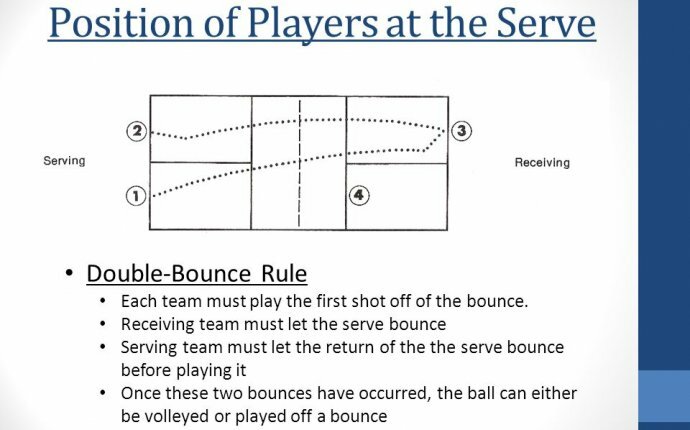 Player A serves first to Player B. They each get one point, and the score is 1-1. The total score is now 2, so it is Player B's turn to serve. Player B gets the next 2 points, and the score is 1-3. The total score is now 4, and the serve switches back to Player A. Player A continues serving until the total score is 6. In an 11 point game, the game must be won by a 2-point lead. If both players score 10 points, the service switches after every point until the game is over. 2.13.04 In each game of a doubles match, the pair having the right to serve first shall choose which of them will do so and in the first game of a match the receiving pair shall decide which of them will receive first; in subsequent games of the match, the first server having been chosen, the first receiver shall be the player who served to him or her in the preceding game.